Stephanie R. Fenniri, a student in the Nonprofit Leadership (NPL) program at Penn’s School of Social Policy & Practice (SP2), has been selected as a 2019 New Leaders Council (NLC) fellow. NLC is a public charity and leadership development organization with 50 chapters across the United States. Dedicated to educating the next generation of leaders and building a new governing coalition, NLC provides support and training to run for office, manage campaigns, create start-ups, build thought leadership networks, and more. 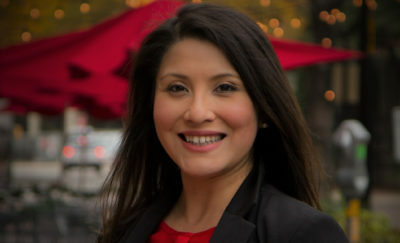 Prior to her time in the NPL program, Fenniri earned a Master of Public Administration and bachelor’s degree from the University of Texas at Arlington, followed by an Executive Certificate in Social Impact Strategy from Penn. Fenniri’s passion for public service stems from her experience as an AmeriCorps member, which informed her commitment to the nonprofit sector. Beyond her full-time enrollment in the NPL program, Fenniri serves as education and social impact director at the Bicycle Coalition of Greater Philadelphia, where she promotes bicycling as a vehicle for creating inclusive communities. She is also a teaching fellow at SP2’s Center for Social Impact Strategy, which supports innovative approaches to public problem-solving. Additionally, she is a podcast assistant and social media strategist for SP2’s Bending the Arc podcast. As one of 23 individuals chosen to be a Philadelphia fellow, Fenniri is taking full advantage of the opportunity to scale-up her efforts as an innovator for social impact. As a dedicated leader who is ready to effect meaningful change, she has big plans in store already.